Notes: Perform 2-3 warmup sets, then the 5 working sets. Feel free to add weight each set as needed. Safety Note: Broad jumping can cause shin splints if you land with a flexed foot. As has been stated in posts earlier this week; there really is a method to this madness. This is especially true when dealing with our bi-weekly gymnastics specific classes. Many members fresh out of On-Ramp have heard the terms Hollow Position and Proprioception on a regular basis concerning gymnastics. Hollow position is an extremely common position that transfers over to almost every movement we perform in CrossFit. If you are unfamiliar to the hollow position, which I hope you are not, please watch this video here to jog your memory. It is the safest, strongest, most balanced position your body can be in while performing handstands, pull ups, push ups, overhead press, etc. Mastery of this movement through conscious thought and application will show great benefit to your overall strength, mobility, and performance. Proprioception refers to a sense of joint position and is often explained as your body’s awareness in space or its surroundings. Balance is a crucial piece to this concept and directly relates to gymnastics for obvious reasons. Proprioception training is highly common in rehabilitation of injured athletes, but it can just as easily be used to prevent injury (which will also be touched on in point 3 below). As strong as we CrossFit athletes are, without proper balance and awareness in our surroundings we can easily break an arm or roll and ankle to the point of serious injury. 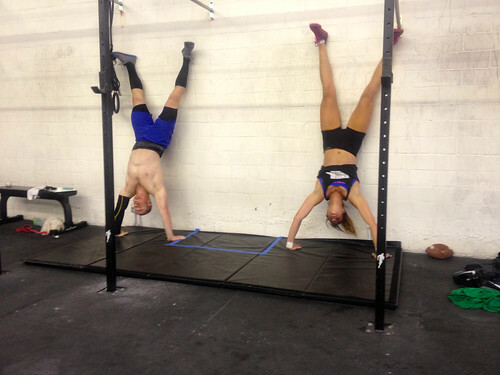 There are 10 physical skills CrossFit focuses on that will make you a complete athlete. Those skills are; cardiovascular respiratory/endurance, stamina, strength, flexibility, power, speed, coordination, agility, balance and accuracy. It is my belief that Olympic Lifting hits every one of these skills. It is also my belief that gymnastics requires each of these skills. Gymnastics is all about efficiently moving your body with strength and power. Improvements in your gymnastic movements will often bring about impressive gains in other aspects of CrossFit. Olympic Lifting and Gymnastics, when done correctly with proper discipline, are the perfect marriage and can make a phenomenal athlete. We should be able to take our skills and drills from gymnastics and make them applicable to every other movement we do daily at PCF. When thinking of CrossFit as a sport and talking with members/athletes that want to be competitive with CrossFit I always start talking about commitment, absolute strength, endurance…and then I stop and tell them, “Wait, the first thing we need to focus on is your mobility.” Ask almost any CrossFit athlete and they will probably tell you they spend the same or more amount of time mobilizing their body than actually lifting/conditioning. They perform these self-myofacial release techniques for mainly two reasons, 1) They’re sore and 2) Increase range of motion. Range of motion allows them to be as efficient as possible when performing barbell and gymnastic movements. Pain is caused by many things but when it comes to CrossFit, its usually one or two things; strength and mobility. Proper joint alignment and strength is crucial to having success in CrossFit but its even more important for overall health and well being. Being flexible allows for greater joint mobility, improves circulation throughout the body and helps to prevent joint injury. If you have pain address it. We have an amazing resource with Dr. Steve and all the physical therapy videos under the Physical Therapy tab. Watch and learn. CrossFit can be overwhelming, believe me. I remember the days when you just worked out for an hour and went home with this amazing high. Now, its become a little more serious and you really have to take a step back and look at the whole picture. I love seeing how things are related in history, politics and, now, CrossFit. Every single thing we do inside the box and outside are directly related to your overall health and performance. Five years ago, if someone asked me how gymnastics and olympic lifting are related I would say “they aren’t, right?” What a fool I was! They are connected in more ways than I ever thought. Gymnastics, more than anything, will transfer over and improve every aspect of your CrossFit experience.